This site is dedicated to the Southeast Asia trilogy authored by Robert Smith. The trilogy that commences with the founding of Kambujadesa (modern day Cambodia) by Jayavarman II in 802 A.D in the novel, "The Kings of Angkor." The book is written using historical narrative, and is a recreation of events as they might have been. The story stays as close to the history as possible, given the limited records available, and enhanced with the creative touch of the novelist. 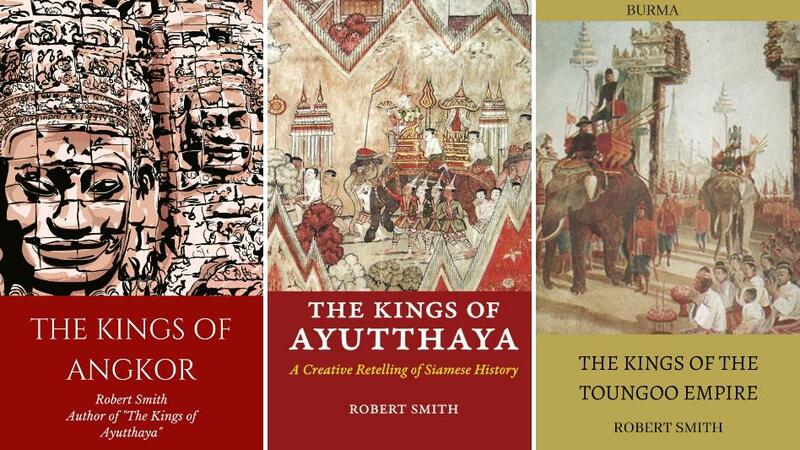 "The Kings of Ayutthaya, A Creative Retelling of Siamese History" published by Silkworm Books in Chiang Mai, Thailand and is a novel based on the kings and the history of the city and kingdom Ayutthaya. The book commences with the founding of Sukhothai at a time when the former dominant Khmer Empire was starting to decline. The kingdom of Sukhothai had a huge influence over the development of Ayutthaya and that became increasingly apparent over the centuries. The book blends together the history of the time, with that written after, and includes many of the myths and legends that spanned the time of Ayutthaya. "The Kings of the Toungoo Empire," was originally published under the title "The Rise and Fall of the Toungoo Empire," a title that reflected the short-lived empire of only four kings. In that time it became the largest empire in the history of Southeast Asia, and it is story that needed telling. The novel overlaps with "The Kings of Ayutthaya" during the reigns of King Maha Chakrapphat, King Maha Thammaracha, and King Naresuan, but examines events from a Burman perspective both before and after that period. It is a tale of the gunpowder kings, religion, vendettas, and deaths in their millions. One spin-off novel was "The Tiger King of Siam," a book, set in both England and Siam, and blends history and fiction to detail the life of King Suriyenthrathibodi (The Tiger King.) My other books are detailed in "The Author" section with updates in my blog. Please browse the individual pages. They will give you a feel for each book.